In previous episodes of the GFE podcast we’ve talked a fair bit about inflammation and how inflammation contributes to many modern diseases. This is because it happens internally on a cellular level and literally changes our cells. So I thought it was time for a practical session on foods and their relationship to inflammation. Need some help with inflammation? Inflammation is a contributor to many modern lifestyle conditions so it is something we want to be concerned about. We talked about the concept of inflammation in episode#17, we also covered heart disease as an inflammatory condition in episode#30 and fat cells being involved in the process of inflammation in episode #32. If you’d like to know more detail you can go and listen to those previous episodes but just a really quick recap. When we think of inflammation it’s not just arthritis or an inflamed joint because of an injury, it’s how modern lifestyle, particularly our diet is causing a low grade systemic inflammation throughout our whole body. This is all happening at a cellular level, we can’t see it but it is happening and it is contributing to the development of many conditions because it changes cells in such a significant way. Essentially all of these modern foods that we have engineered are causing injury to the inside of our body. Perhaps in small doses our body could cope but in the massive proportions we eat them and the major over consumption patterns we have, then the injury goes unabated, it is like an attack on the bodies natural processes and functions. The great thing is that modifying our diet and nutrition can help prevent, delay, and even heal many health conditions because we can influence inflammation and help reduce it. That’s what I love so much about nutrition, it’s something we can all control if we choose to and it brings great results when we do implement positive changes. So today we’ll briefly explore some of the foods that cause inflammation and then talk about loads of foods that help fight inflammation and make you healthier. It’s certainly not rocket science, in a way it comes back to simplicity. Getting back to the fundamentals of real, natural food and we’ll discover that together today. Though celtic or himilayan salt can add beneficial properties to a quality diet, the type of salt we’re talking about here is the refined table salt that is included in copious amounts in packaged foods and drinks. Yes, that’s right folks, to keep our palate happy many products are laden with salt becuase it makes things taste better. Problem with that is we are now consuming the stuff in copious amounts, the average male consuming 5g over the recommended level of safe consumption, for females it’s around 1-2g. Foods like instant oatmeal, white rice, white bread, white flour, instant cereals, many crackers, cakes, pies, breads, desserts, muffins, white pasta and noodles, bagels, pizzas, and the list could go on but I’m sure you get the picture. Refined starches have had all the bran, hull and fibre removed during the grain processing and this leaves them empty of any nutritional value. Sugar, sugar, sugar, it’s everywhere, it comes in many forms and under many different names. I’m sure I don’t have to list all the products and places you can get sugar, right? You know how easy it is to eat too much of the stuff, we do have an innate liking for it after all. We like it so much that we are over consuming sugar in copious amounts. The average person 100 years ago only consuming 10g of sugar, now we consume on average our own bodyweight in sugar per year. Yes, that’s right above 60kg/130lbs per year! Trans fats are man made fats that are extremely un-natural and harmful to the body, particularly in promoting inflammation. Trans fats enhance flavour, texture and promote shelf life so are prefered by manufacturers. Trans fats occur as a result of turning liquid vegetable oils such as those below into solid forms. Trans fats come in foods like cookies, crackers, cakes, muffins, pie crusts, pizza dough, snack foods, fried foods and frozen dinners. Manufacturers are required to note the amount of transfats on food labels, but be aware that it the content is below 1g, they don’t have to label it but it still may be in the products. Refined vegetable oils are frequently promoted as healthy options because they are unsaturated fats. However they are very high in Omega 6 fatty acids and because we over consume them in many of the foods above, and don’t consume enough Omega 3s. Despite what is commonly promoted these oils contribute to increased inflammation. They are also highly processed oils and thus are not natural to the body and are best avoided for good health. Many of the foods already mentioned above are filled with a combination of salt, refined starches, vegetable oils, and sugar, making them a pro-inflammatory combo. I think we have to remember that we have enginnered this environment we live in. We have ‘engineered’ our environment to favour certain types of food and the overconsumption of energy dense processed foods. By default this has become the ‘easiest’ choice because commercially this is what is on offer, the options are overwhelming and tempting. But that does not mean this is normal or natural. The best way to avoid the problem is to cut the crap and start eating real food. And we’ll talk about that now when we go into foods that help fight inflammation. 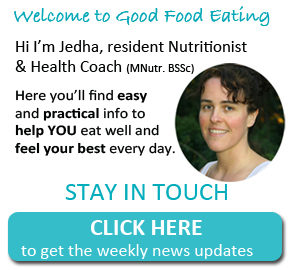 I came across a couple of good research studies recently that have classified food into an anti inflammatory index. 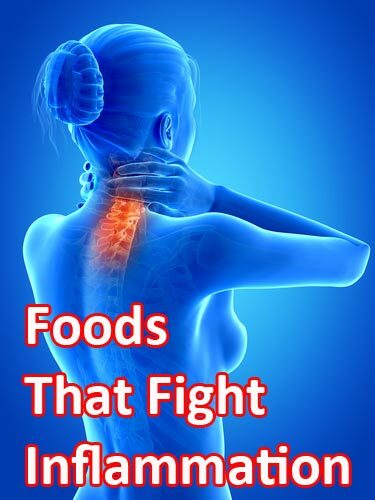 I have used those studies to make up this detailed list of anti inflammatory foods that I put on the GFE blog, I’m not going to go into the WHOLE list of foods because it’s a really long list but I will leave a link to that in the show notes for todays podcast at GFE.com/36. So I took the details of these 2 studies and listed the foods or nutrients in descending order from the most anti inflammatory so we’ll walk through those foods and nutrients now and then we’ll talk about 3 simple strategies you can use to decrease inflammation dramatically. Most potent sources of magnesium are fruit and vegetables, we talked about magnesium in episode 19, seaweed, potatoes, spinach, chard, tomatoes. Acorn squash, artichokes, kale, and fruits like bananas, tamarinds, figs, avocadoes. Then we have turmeric, which is a spice, so you can start learning how to cook more dishes with turmeric. Next we have the beta carotene and vitamin A and if you think of orange and green foods you will get these nutrients from those so things like sweet potato, carrots, peas, spinach, kale, mustard greens and pumpkin. Tea contains polyphenols and antioxidants that help reduce inflammation and this is more so for green tea so quit your caffeiene and drink green tea instead. And then we have fiber and our best sources of dietary fiber are fruit and vegetables. There are many fruits and vegetables, so eating plenty of those provides an anti inflammatory effect. We simple have to increase our intake of fruit and vegetables and when we do this what generally happens is we reduce our intake of processed and packaged foods, salt, sugar, and unhealthy fats and oils. When we increase veggies and choose real foods we naturally decrease inflammatory foods. 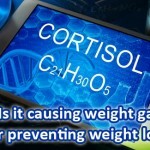 What usually happens as a consequence of this is that we lose weight, and weight loss significant;y helps reduce inflammation because as we discussed in a previous podcast, fat cells are not just dormant but are an active endocrine organ that produces and secretes many hormones and cytokines and unfortunately most of them are pro-inflammatory once this occurs. So lose even just a little bit of weight and you start feeling amazingly better, lose a lot and you are a whole new person, your body is literally more alive and you have decreased inflammation. But when it comes to being practical right here, right now what can you do? Long chain n-3 fatty acids – Omega 3s decrease gene expression of many inflammatory markers, help reduce fat cells and are a very potent anti inflammatory. Essentially there are 2 ways to increase Omega 3s, through supplements and through dietary sources. You’ve probably heard of the anti inflammatory benefits of Omega 3 fats. INCREASE VEGETABLES INTAKE – Vegetables contain various components that reduce inflammation – magnesium, fibre, folate, antioxidants, vitamin C, beta carotene, plant plyphenols, flavonoids. Start eating more veggies and that doesn’t mean boring and tasteless, it doesn’t mean just eating steamed veggies every night. There are so many ways to include veggies and really interesting ways to cook them so if you don’t know how, then learn because eating veggies really is one of the easiest, most cost effective, and practical ways to reduce inflammation and improve your health on so many levels. 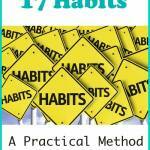 So they are 2 practical and highly effective things you can do right now. Eat more omega3 and/or take supplements. And eat loads more veggies. So I hope this has helped open your eyes a little bit more to foods and their role in inflammation. Thanks for joining me and if you get time, please head over to itunes and leave us a rating and review. I’d really appreciate it. 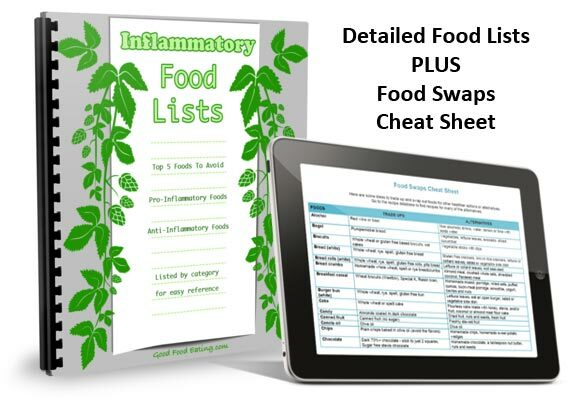 <<< Grab a copy of my food lists and make reducing inflammation easy! 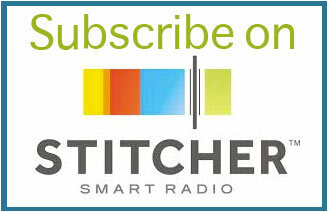 Subscribe: NEVER Miss An Episode!